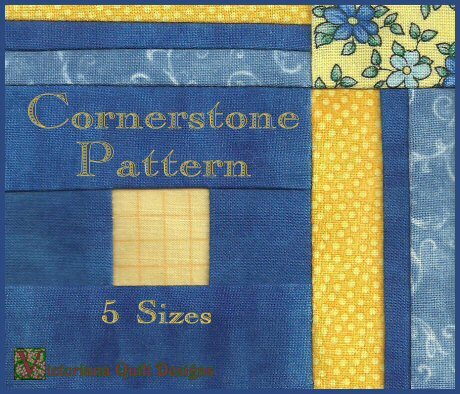 Original quilt patterns - free with membership or to purchase individually. She just won Best of Show, 1st Place, & Viewers Choice for her Victoriana Album quilt, at the Piece-ful Harbor 2019 Quilt Show by the Colonial Quilt Lovers Guild in Elizabeth City, North Carolina. You can still see Jackie & her quilt here. Which has encouraged me to re-offer this Stitch Along. 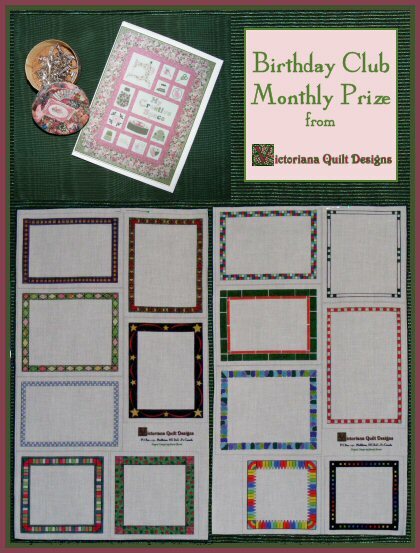 for non-expiring Victoriana Quilt Designs Members, will begin June, 2019.
appliqué your treasure as we go. You will need to register (email me), to join the Stitch Along. The registration confirmation email includes the fabric information. & Join this Stitch Along! It's time for fun fabric collecting! 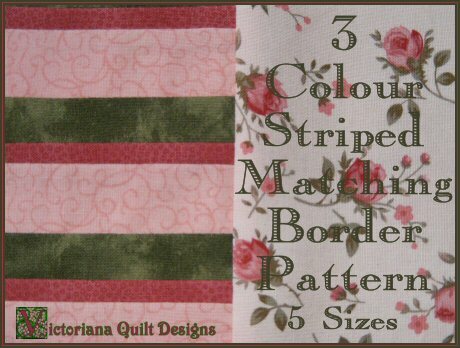 You'll find lots of tips for picking the fabric for your Victoriana Album quilt here. You'll also find a link to receive a colouring page, on the special Stitch Along page, which will allow you to colour your ideas. for extra tips that will be helpful. and the Finish is online. Another in this series of sweet baby quilts. Free to Members for the First Month! 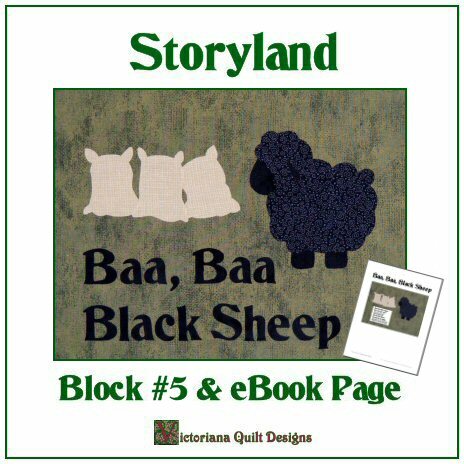 The second block of this new series is here. Gather your blue & white fabrics and come stitch along! The fourth design this series! Each block is free to Members for one month. 7 Different Labels per Panel - Two Versions! Adding a label to your finished quilts is an important way to share the details, for many years to come. My Fabric Quilt Labels make that super easy to do! Version 2 is now also available. Close up pictures and more details here. You can read posts from My Creative Space here. 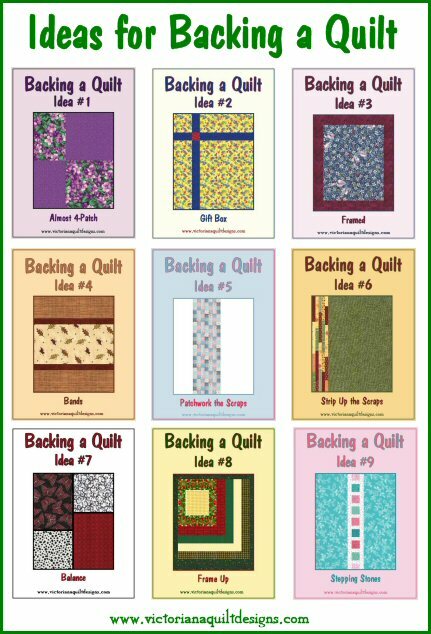 This collection of Ideas for Backing a Quilt is available in a .pdf file format. Plus there are an additional 3 Ideas! 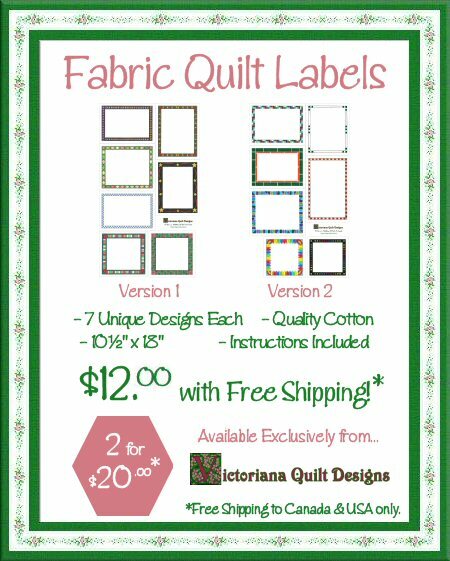 **SPECIAL NOTE: I've been sharing the calculations & instructions for these 12 ideas with Victoriana Quilters Members (free with membership). Newest Free Quilt Pattern - Second in a Series! Free Quilt Pattern - First in a Series! 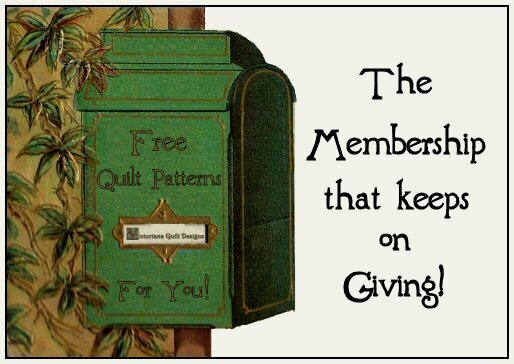 Come join our quilting community...Sharing with Quilters! Quilter Pen Pals & Quilt Charm Swaps pages. 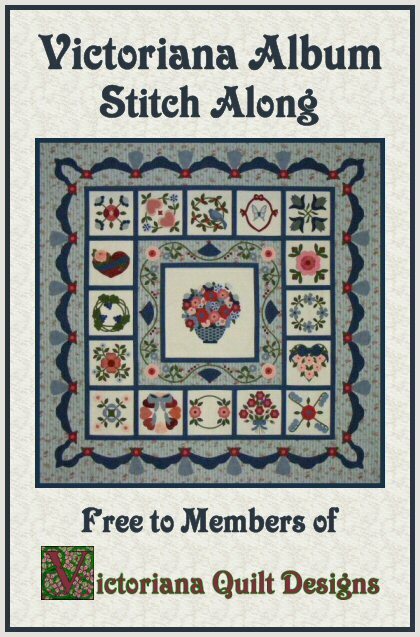 Meet Quilters' from your hometown or around the world! 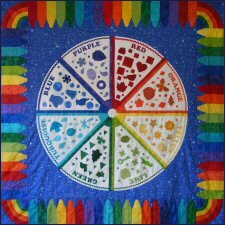 This Quilt Guild Reference List is where you will find a list of quilt guilds and groups from all over the world. If your group is not listed, fill in the details - I would love to add them. This section has news, notes and important reminders for members. Be sure to read the new entries and reminders every month. See the long list of quilt books available. 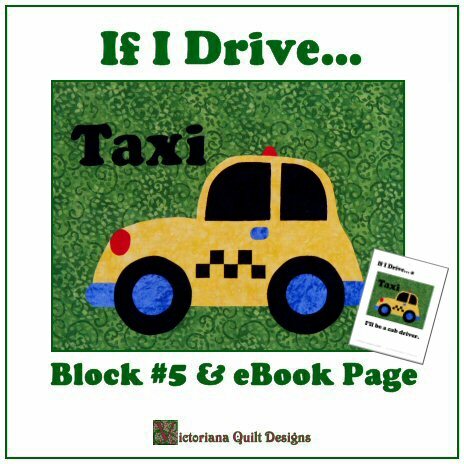 Please feel free to list your used quilt books for sale or trade! 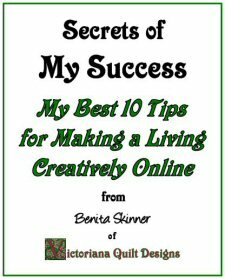 These pages contain links to free quilt lessons, information and how to's. This list makes a good quilters online resource for the Beginner Quilter, or anyone needing some refresher information or tutorial on a new quilt technique! Available exclusively to newsletter subscribers. All of these designs can be used as quilting motif or for a redwork/embroidery project. Please Note: This feature is on pause for a year, and the replacement will be a fun series - Seasonal Yo-Yo's. The newest tip plus a 17 year collection! For Sharing on Your Facebook Page! 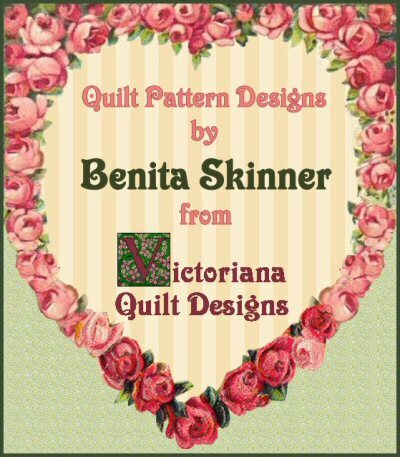 Victoriana Quilt Designs Facebook Page: This is where we share quilt pictures, ask questions and share quilting online with other Facebook Quilters...from all around the world! I've been enjoying the great visual inspiration here! ~Registrations for the 2020 Birthday Club are being taken now. 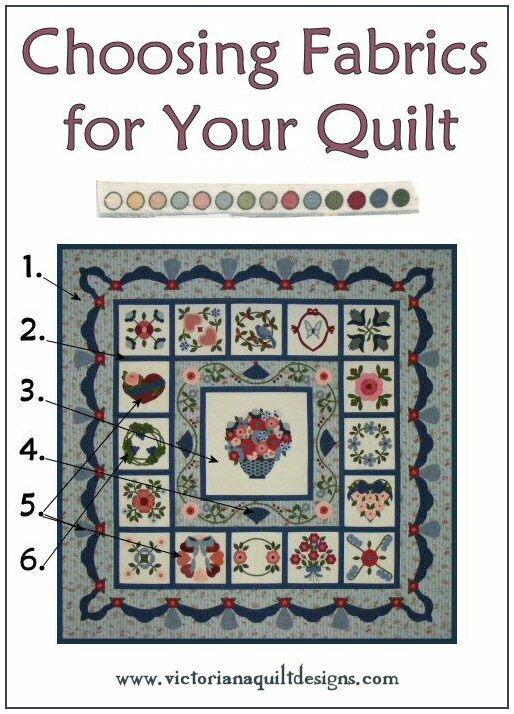 Members can receive free quilt patterns, for recommending Victoriana Quilt Designs (Memberships or Patterns) to your quilting friends! Everything on this site is for personal use only.